The Santa Anita Handicap was billed as a two-horse race and it became on at the top of the lane, when 4-5 favorite McKinzie hooked up with 2-1 second choice Gift Box. The pair battled the length of the stretch, and while Gift Box was slightly ahead on the wire, McKinzie got a perfect head bob to make the photo finish very close. Judges ruled that Hronis Racing's Gift Box finished a scant nose ahead of McKinzie to earn his first Grade 1 victory at six years of age. A son of Twirling Candy, the John Sadler-trained Gift Box covered 1 1/4 miles over Santa Anita's fast main track in 2:03.02. Gift Box's jockey Joel Rosario turned the tables on runner-up Mike Smith (McKinzie), as the order of finish between the two riders was reversed earlier on the card in the Santa Anita Derby (Smith won with Roadster while Rosario was second aboard favorite Game Winner). With longshot Prime Attraction showing the way into the Club House turn, Gift Box and McKinzie were in close attendance, no more than a length and a half off the early lead. Mid-way around the far turn, Rosario, who had his mount well in-hand, cruised to the lead past Prime Attraction a quarter mile out and was immediately engaged to his outside by McKinzie. From the three sixteenths pole home, it was a classic head and head battle that had all 30,713 on-track fans enthralled and yes, if even for a couple minutes, maybe far removed from the weight of an onslaught of bad news. For Sadler and owner Hronis Brothers Racing, LLC, it was their second Big 'Cap win in a row, having won it last year with eventual Older Horse of the Year Accelerate. Originally based in New York, Gift Box, a 6-year-old horse by Twirling Candy, out of the Unbridled's Song mare Special Me, had been idle since his first Southern California start, a half length win in the Grade II, 1 1/16 miles San Antonio Stakes on Dec. 26. “This is very special,” said Sadler. “I grew up with this race, to win it two years in a row is incredible. I came here as a kid with Lou Rowan (owner/breeder and original board member of the Oak Tree Racing Assoiciation) when Quicken Tree won the Big 'Cap (1970), so it means a great deal to me. Off as the 2-1 second choice in a field of six, Gift Box, in his first Grade I win, paid $6.20, $2.40 and $2.20. With the winner's share of $355,000, he hiked his earnings to $879,160 and improved his overall mark to 15-5-5-2. Bred in Kentucky by Machmer Hall and Carrie and Craig Brogden, Gift Box was a $135,000 weanling at the Fasig-Tipton Kentucky Fall Mixed sale. For most of his career Gift Box has been trained by Chad Brown, but after an allowance win in March of 2018 the horse was transferred to Sadler. Since moving to the West Coast Gift Box has won both of his starts, including the G2 San Antonio along with the Big 'Cap. For his part, McKinzie lost nothing by way of stature in defeat as he was 3 ¾ lengths clear of longshot Mongolian Groom. Off as the 2-5 favorite, 4-year-old McKinzie, who carried top weight of 123 pounds while spotting the winner one pound, paid $2.10 and $2.10. Ridden by Geovanni Franco, Mongolian Groom, off at 53-1, paid $3.40 to show. 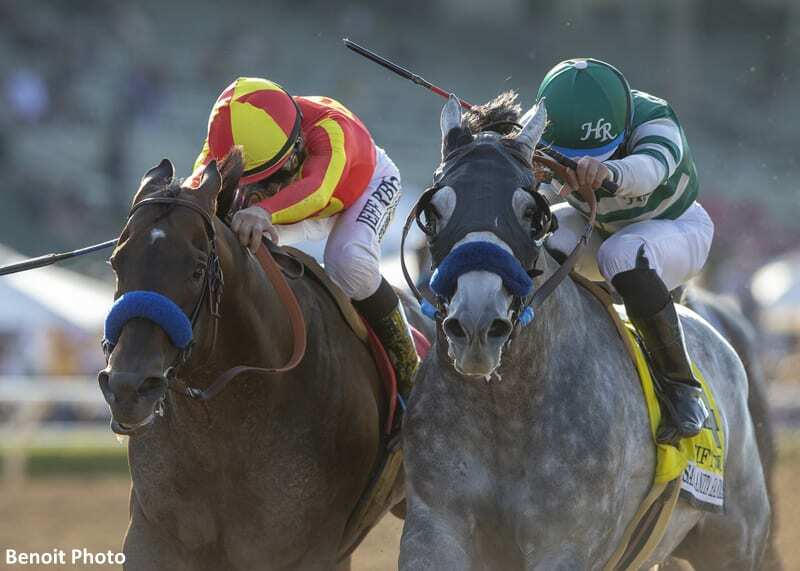 Although Baffert was denied his sixth Big 'Cap win, he took his record ninth Grade I Santa Anita Derby two races earlier, as Roadster upset his stablemate Game Winner by a half length in a thrilling stretch run that barring something unforeseen, should propel both colts to center stage in next month's Kentucky's Derby. This entry was posted in NL Article, Racing and tagged gift box, Horse Racing, joel rosario, john sadler, mckinzie, mike smith, santa anita, santa anita handicap, santa anita park, santa anita park closure, Twirling Candy by Paulick Report Staff. Bookmark the permalink.